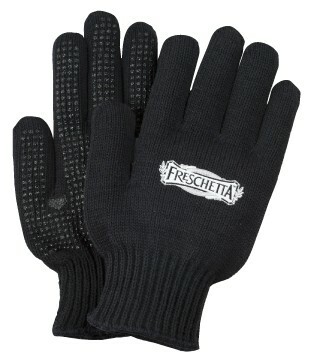 Black knit work & freezer gloves, black PVC grip dots on palm, elasticized wrist, medium weight, size large. 80% recycled, certified by OEKO-TEX standard 100. Popular as freezer gloves worn by grocery store employees. A great way to promote your retail brand! Available in black, green, red, royal blue, orange. For custom colors please inquire.